Though Initial D is not the only car related anime out there, I have always considered it to be the quintessential car racing anime for people interested in Japanese cars, tuning, and drifting. In fact, without any exposure to Initial D, I might not have been as interested in cars as I am today, especially aftermarket tuning. While a lot of the stuff that happens in Initial D is far from accurate, it was this show that drove me to study more about the way cars with different drivetrain layouts react in different situations. I really do owe quite a bit of my knowledge to Initial D's inaccuracies. Initial D has been around for about 18 years now, primarily in manga form. As an anime, Initial D has so far been divided into four seasons, a movie, two additional side movies, and two clip shows that chronicle all of the races from the first three seasons and movie. Initial D Fifth Stage is the fourth, and final season of the Initial D anime series, which coincides with the final few chapters Initial D author Shuichi Shigeno has written. Fifth Stage takes you through the final expeditionary races of Project.D, the racing team main character Fujiwara Takumi has joined to become a better racer. This final expedition takes Project.D to the Kanagawa region Japan, facing off against what is supposed to be Project.D's toughest series of opponents yet. 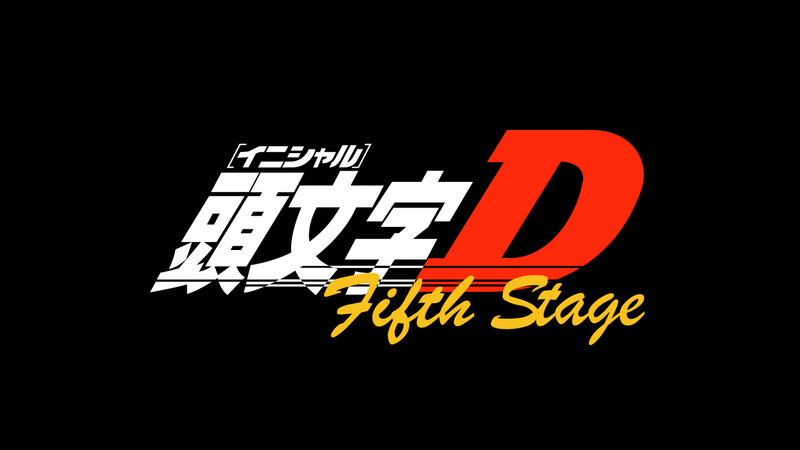 Does Fifth Stage live up to its predecessors, offering both compelling story and gripping racing? I have often written about some of my on-road experiences on this blog, detailing the foolish things I have seen from the driver's seat. Over the course of the last few months, the feeling that things are getting progressively worse has been hard to shake. The number of miles I drive each year continues to drop as my personal commuting needs are increasingly met by two-wheeled and public transportation options, but the number of incidents of, what I can only classify as, pure stupidity I observe when I am behind the wheel continue to increase in frequency. Take the incident I observed earlier this week while I was out to get groceries. The road that I was traveling on was two lanes in each direction with nothing separating opposing traffic aside from a set of double-yellow lines. This road, especially during rush hours, is exceedingly busy in both directions and, given the rather narrow lanes, is a bit crowded to say the least. Approaching an intersection, it widens ever so slightly to include a left-turn only lane in each direction that can accommodate about 5 to 6 cars before it meets back up with the travel lanes. On this day, I came up to the intersection in the left travel lane and am about 8 cars back from the light. I can see that there are 2 cars in the left-turn lane as the light turned green to allow cars proceeding straight to go, but the left turn signal remained red. All of a sudden, a flash of light in my driver's side rear-view door mirror caught my attention. A beige Toyota Camry about another 8 cars back behind me had pulled into the opposing traffic lane and was trying to rush up to the left-turn lane. Opposing traffic was already beginning to cross the intersection as the Camry whizzes by my car, all the windows down, allowing me to see a father driving with a small child in the rear seat, gazing out the side window. Horns blared, lights flashed, and tires screeched as the Man in the Camry just barely avoided a head-on collision in what, I am almost certain, was a sphincter-clenching moment of utter imbecility. This week, we bring you a bit of crazy with a happy ending. Riding a motorcycle takes a fair bit of skill and concentration and is already pretty mentally taxing for some folks. The rider in this video, however, is clearly very skilled and completely unaffected by the rigors of motorcycle riding and is extremely observant to boot. Upon seeing a mug resting on the bumper of a pick-up trunk, the courageous rider races to catch up to the truck and then, with some precision riding skills, swoops in and rescues the helpless mug before it shattered into a million pieces on the asphalt. And, as if that weren't enough on its own, the rider proceeds to chase after the owner of the mug and kindly returns the still coffee filled container. This impressive feat of riding is truly praiseworthy for its demonstration of motorcycle handling skills, close proximity riding, and mental focus. Now if the rider could only be bothered to add a little protective gear to the mix, they could be the poster boy for the motorcycle community. Watch the video and tell us what you think about this rider's actions. In the past few months, as we have gone back and forth about what should become of East-West Brothers Garage, my brother and I have taken a serious look at what we hoped to get out of this little project of ours. In many ways, it has legitimized an excuse for us to go and test drive cars and motorcycles and not feel guilty about taking up the time of a salesperson as well as spend money on experiences we might not otherwise have been willing to spend money on. We sought a way to get our voices out there into the vast sea of the Internet, sharing our experiences and thoughts with other enthusiasts who valued a balanced opinion and who also understood the value of all forms of wheeled transportation. To that end, we have spent the last few weeks working our and implementing a plan. Today, we would like to welcome you to the newly updated East-West Brothers Garage, which not only has a new look and new URL, but also an expanded presence on social media as well as YouTube. We intend to continue to publish articles three times a week - every Sunday, Tuesday, and Thursday evening. Additionally, we will be creating new original content for our YouTube channel, including driving/riding videos, touring videos, and a few surprises we hope you will enjoy throughout the year. As we continue to grow, we hope to bring guest bloggers into the mix to offer even greater diversity of opinion and share with us their thoughts on various topics, hopefully adding more authenticity with their voices. At the end of the day, our goal is to offer a unique voice that not only presents the views of a single group of road users, but really tries to encompass the views of all different groups who share our roads. We want to be more than just an "automotive" blog. Instead, our desire is to be a true road users blog that offers not only a focus on motorized transportation, but also includes non-motorized wheeled transportation that many of us share the road with every day. We hope that we can inspire greater discussion that will inspire people to take little steps to making everyone's experience on our roads just a tiny bit better. So, many thanks to those who have returned to continue to support us. Those of you who are joining us for the first time, we certainly hope that you like what you see and will return for more! Here at East West Brothers Garage, our focus is usually on vehicles powered by some sort of motor or engine. However, as much as we enjoy our petrol powered vehicles, the both of us do occasionally feel the need to use something more environmentally friendly. What is more environmentally friendly than a vehicle powered by man itself? I am, of course, talking about bicycles! The specimen I review here is a recent purchase of my own, the K2 Astral 1.0 hybrid road bike. I had originally purchased a $95 Wal-Mart mountain bike, but that ended up being a terrible idea as the gears did not all work and the bike was improperly sized. After selling the Wal-Mart bike on Craigslist, I made it a point to spend more than $100 on bicycle and to get something that actually worked and fit me properly. I will admit though, I do not know a whole lot about bicycles. I have, at this point in my life, only owned three bicycles, including the one being reviewed here. The first bike I ever owned was, yet again, another $90 Wal-Mart bike that I purchased to use while attending UC Davis. After owning the bike for roughly two days during my freshman year, it was stolen and I never saw it again. Despite registering the bike with the police a day after I bought it, it was never recovered. 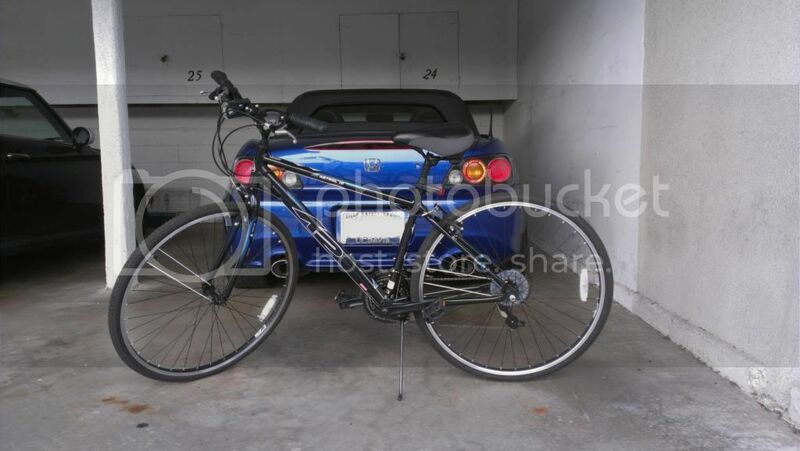 The second bike was the $95 Wal-Mart bike I described above. And so we come to the Astral 1.0, which cost $299 ($249 after a Google offers discount). Is this bike worth three times the cost of the Wal-mart bikes? Recently though, Honda decided to do something crazy. In conjunction with Honda's British Touring Car racing team and Top Gear, Honda built a lawn mower that will do zero to 60 mph in about four seconds, and has a top speed of over 130 mph. Sounds pretty darn crazy, right? Honda is already billing their mad creation as the world's fastest lawn mower, and frankly, I believe it. This "mean mower, as Honda calls it, started life as a Honda HF2620 riding mower. A custom chassis replaces the HF2620's chassis, and the engine is swapped out with the 1000cc unit from a Honda VTR Firestorm motorcycle. Other modifications include a paddle shifted six-speed transmission, a race car steering wheel, a Cobra racing seat and harness, and the wheels and suspension from an ATV. The only thing left of the HF2620 is the body. The result is 109 horsepower strapped to a 309 pound curb weight. That four second zero to 60 time does not seem so unrealistic after all. All these modifications do not mean that Honda's "mean mower" has lost its ability to do what it was originally designed for. At speeds under 15 mph, the "mean mower" is still capable of mowing lawns. Two electric motors spin the 3mm steel cutting cables at 4000 rpm for maximum cutting efficiency. Unfortunately, the mowing bag at the back of the mower has been retrofitted to hold the "mean mower's" fuel tank, a high-capacity oil cooler, and secondary radiator. So while you can still mow the lawn with this monster machine, you will not get much of your lawn mowed before you would have to empty the bag. 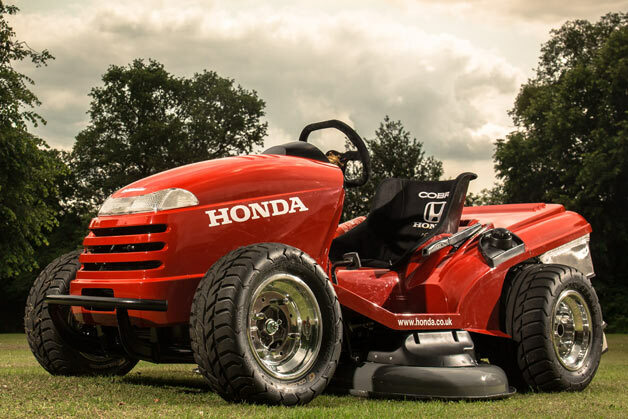 Honda's "mean mower" is, of course, a one off and will most likely never go on sale. In the meantime, we can at least get our jollies watching this thing run around a track while we all patiently wait for the 2015 Acura NSX. Enjoy the videos and original article after the break! When this latest generation of the Hyundai Sonata was first introduced, I was impressed by its fantastic design and the great specs on paper. Imagine my joy when my father-in-law returned from overseas and informed me that he was also very smitten with the mid-size Hyundai sedan and was interested in purchasing a top-spec Limited model with the powerful, yet frugal, 2.0-liter turbo-charged engine. In addition to the sweeping fluidic design, what caught his attention was the exceptional value for money, the high level of standard equipment, and the fuel economy numbers that would be a leaps and bounds improvement over the gas-guzzling SUV that serves as their other car. After a brief test drive and a fair amount of research online about the price, we reached out to the local Hyundai dealer to start negotiations on an available car. The color scheme that had our attention was the rich navy blue with the gray interior and we absolutely had to have the fully loaded Limited package with the navigation system. The local dealer had one in stock, but was not willing to be agreeable on the price, so we put out feelers to all the dealers in the area to see who would be willing to go the extra mile since it was the end of the year. Finally a dealer a little ways away called while we were having lunch and said they were happy to not only meet, but even beat our asking price on exactly the car we were looking for. With a little back and forth drama, that at one point had us worried we were going to have to get a red car, the dealer ultimately delivered by doing a swap with a dealer over 100 miles away. They even went the extra mile to deliver the car to our door at almost nine o'clock in the evening. Props to the team at WIN Hyundai of El Monte for going the extra mile to deliver an exceptional customer experience. With the 2013 Pikes Peak International Hill Climb, there is a shift in the paradigm of this storied race. With its 156 turns and nearly 10,000 feet of elevation change, Pikes Peak is a grueling test for any vehicle and any driver. Many competitors build customized cars and motorcycles specifically designed to tackle this course and its unique challenges. At this year's race, we saw a new first: the first time that an electric vehicle has won a class not specifically designated as being for electric vehicles only. Yes, that's right, the electric vehicle has bested its gas-powered counterparts. Lightning Motorcycles, a manufacturer of electric motorcycles, outright won its class this year with its entry, besting entries from racing stalwarts such as Ducati. This is particularly exciting because it signals that, at least with motorcycle racing, electric bikes absolutely have the ability to compete with their fossil-fuel powered counterparts. It could also signal the possibility that electric motorcycles will gain further popularity for street use as the technology begins to reach a point where the cost and performance are becoming comparable. Call me a fanboy, but I see this as further proof that electric vehicles have a viable future as a part of our transportation infrastructure. Link to the original article after the jump. For those of us who rely on two-wheeled forms of transportation, security is always a concern. Not having solid sheet metal and glass to prevent access and entry to our bicycles and motorcycles, riders of all kinds continue to look for innovative ways to protect our investments. That is why the BikeSpike caught my attention when I saw it. This small device, which was originally developed for bicycles, that can be attached to any two-wheeled vehicle, offers a way to GPS track the location of your bike or motorcycle from your smart phone. While the idea has been around, it has only been available for motorcycles as a part of expensive alarm systems and never as a low-cost standalone option. The BikeSpike allows total control from its smart phone app and allows a user to enter the details of their ride into the app to keep track of the vehicle's information and make it available to law enforcement at the touch of a finger in the event that the vehicle is stolen. The app also allows you to set a geo-fence around the vehicle, triggering a warning if the vehicle is moved out of the designated area. In many ways, this is exactly the kind of thing motorcyclists and bicyclists are looking and for once, it is not so cost prohibitive that only those with money to spare can afford it. Read more about the BikeSpike at the link after the jump. After the lease of my parents' 2008 Acura TL Type-S expired, my mom wanted something that was more suited to her tastes. She liked the TL Type-S in that it was well built, but the suspension was too rough and the car was a bit too noisy for her. The only reason we had a TL Type-S was because I was sharing the car with my mom, so I wanted something a bit sportier than their previous 2005 Acura RL. 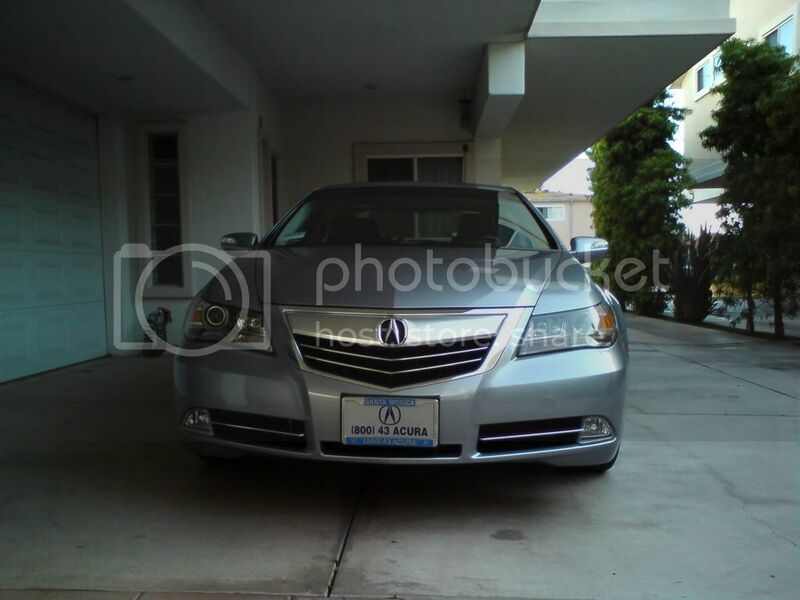 My mom really liked the 2005 RL, so it was only natural that I took her in to check out the 2011 Acura RL. After two years of ownership, and still driving it on a fairly regular basis despite not living with my folks, here are my thoughts on the 2011 Acura RL with Tech Package. I enjoy my fair share of YouTube videos and the Autos category is a regular stop for me. Sometimes, one just comes across something that is just too crazy to pass up. So starting with this post on our nation's birthday, whenever we come across something so completely outrageous that we just cannot pass up sharing some thoughts about it, we will take the chance to share with everyone. This week's video is one that takes place near downtown Los Angeles. An insane driver in an Infiniti I30 wearing plates from Illinois just loses it on another driver, swerving back and forth between lanes, brake checking, and generally driving like a complete idiot. Lucky for us, the poor victim of the lunatic was fortunate enough to have a dash cam running at the time, recording then entire encounter and posting it to Youtube. 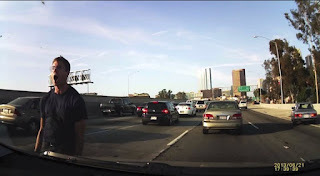 What caps this entire thing off is that the driver of said Infiniti even goes so far to stop his vehicle during a busy weekend crush on an LA freeway and actually exits his vehicle to confront the victim of his tirade, banging on the glass and screaming at him. 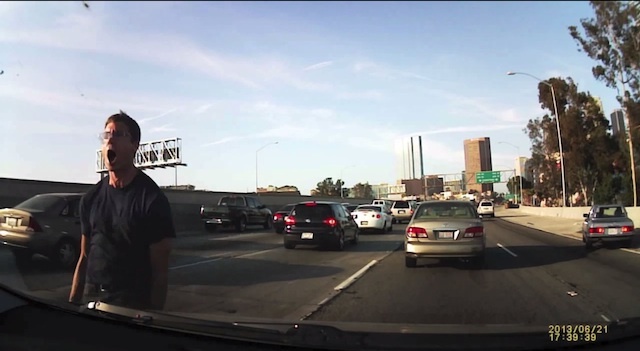 Clearly, this guy needs to cut back on his caffeine intake because this sort of behavior is uncalled for, even in the craziness of LA's legendary traffic. The number of lives this moron endangered with his erratic driving and hair-trigger temper likely numbered well into the dozens, all over what was apparently his own poor driving (check out the crumpled rear quarter panel on his car). The amount of patience exhibited by the victim is downright Zen-like. I must admit, I am not sure I would have been quite so patient had I been caught in this situation. In fact, with a dash-cam running, I honestly would have been tempted to "forget" to brake and just crashed into his car. Of course, my first call would have been to the police to get them on scene so that I could show them the dash cam video and have the idiot arrested. Of course, given his mental state at the time, this might just send him off the deep end. Maybe the best thing to do would have been to just try to get off of the freeway altogether to avoid further confrontation or, at the very least, put a lot more distance between myself and the aggressor. Watch the video after the break and tell us what you would have done if this had happened to you. Have a crazy story of your own, please feel free to share as well. Having a tendency to buy performance brake pads means my wheels are going to get real dirty, real fast. Usually, about after two weeks of driving after washing my car, my wheels are caked in brake dust again. 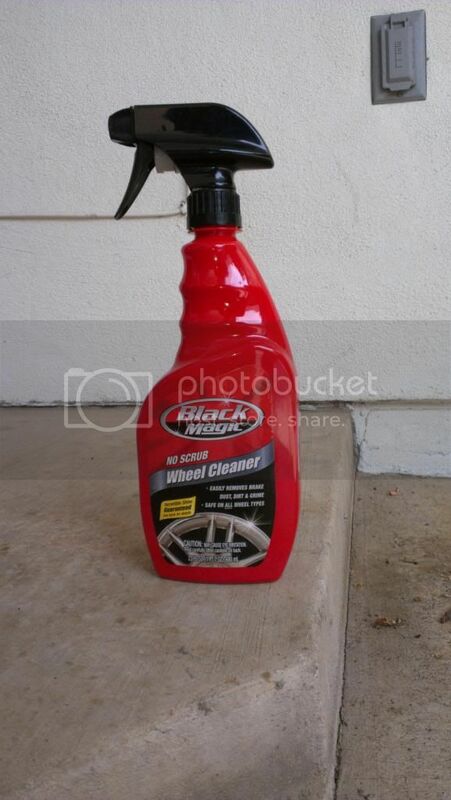 For a while, I had been using the Armor All Triple Action wheel cleaner. It worked reasonably well, and cleaning my wheels became a bit easier than with just soap and water. After running out, I decided I would try something new. The Black Magic product caught my eye because it was "no scrub." Being lazy, not having to scrub would be a godsend. Here's how it worked out.